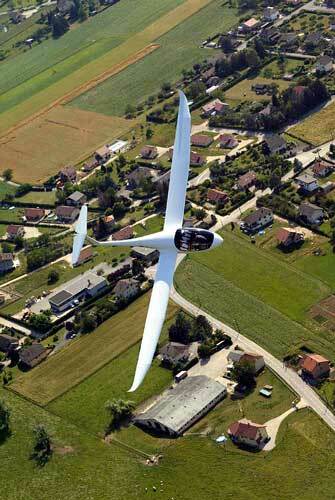 In this latest newsletter we finally have more information on the Taurus aircraft including the factory figures from the official test flight program on the first production aircraft and also a little information from the factory test pilot Tine Tomazic…. Sort of an insiders scoop. Plenty of photos and lots of information to compliment the article…. enjoy. Hello Michael, the Taurus flies extremely well, amazingly it is even more stable than the Sinus, the Taurus maintains the bank (turn) on it’s own it is so well balanced and is a true pleasure to fly. 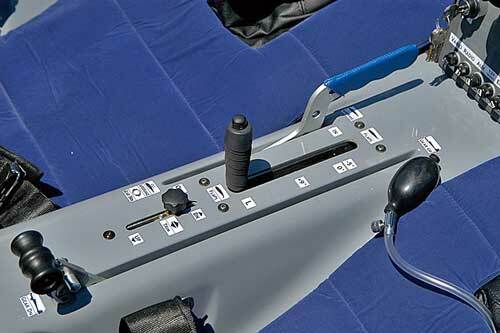 Because of a new control mechanism, the forces on the stick are reduced a lot from the prototype. 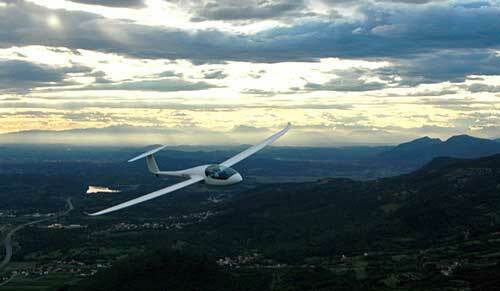 It remains light on the touch regardless of the speed you’re flying at. Stall performance is the same as Sinus (speeds and behavior), only the buffeting is a little more noticeable, which is nice! The buffeting is triggered approximately 5 km/h, before the real stall occurs. In stall and post-stall Taurus remains fully controllable with no sudden drops left or right. Under power it’s impossible to stall the Taurus, which is great!. With the experience and centre of gravity positions we have tried so far the longest take-off distance was 250 meters, this was with absolutely NO wind, temperature of about 28 deg. Celsius, two heavy (100 kg) persons inside and C.G. at the very front limit. Otherwise, with two “normal” persons on board of 80-85 kgs it takes of in 180 metres with no wind, and 130 metres with 5 kts (2.5 m/s) headwind. For me the take-off performance is very much OK as it is now, but we have not yet optimised the propeller, so we can most probably shorten the take-off by another 30-40 metres. 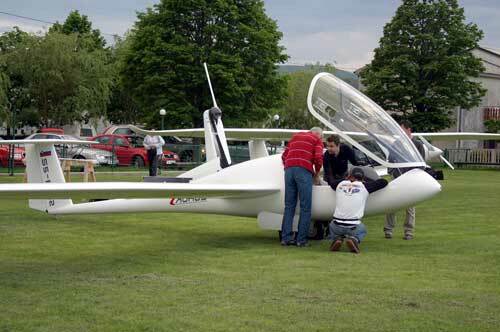 Tine and other Pipistrel staff debrief after a flight in the Taurus. Note how large the cockpit is with a very comfortable seating position and good headroom for large pilots. 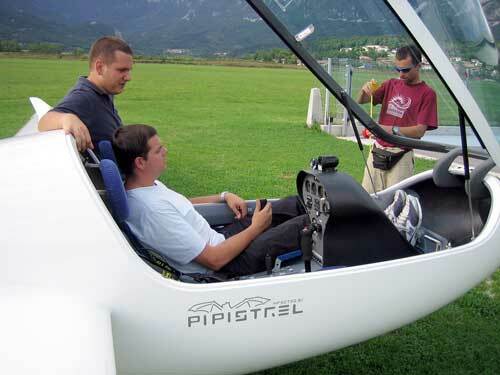 Climb at full load is 2.9 m/s (570 fpm), measured in average to 500 metres (the climb to 500 m (1500 feet) AGL is exactly 3 minutes), with a single pilot 4 m/s (790 fpm). 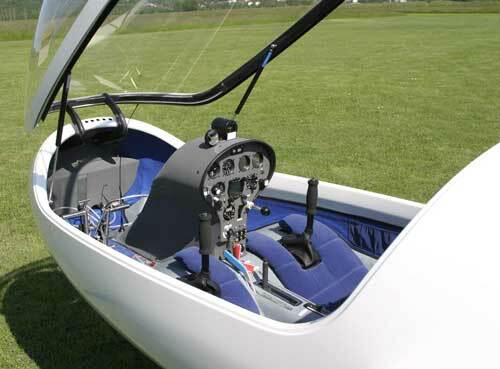 Taurus climbs more than any other 2 seater motorglider and also much more than most single seater motorgliders, so we are very happy about the climb performance. So far, all the systems (retractable gear, retractable engine, engine cooling, cockpit levers & handles) perform just GREAT. No problems so far, only a few loose screws here and there but this will be taken care of in a day or two. Our engineers confirm this is completely normal for a new aircraft, so no worries there. The glide is just like it was calculated or maybe a little better. 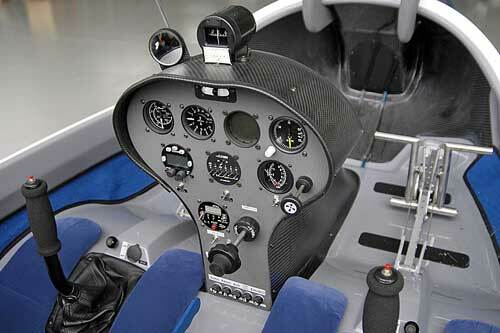 Very silent in the cockpit, the vents for fresh air work extremely well and handling is easy and very controllable on the ground. 45 deg-45 deg roll time is faster than the Sinus (closer to Virus actually), flap settings will be a little different most probably, to enhance the performance even more. We are working on figuring out the ideal flap settings but it will probably be like this: minus 5 deg – high speed above 130 km/h, 0 deg – climb and glide from 110 – 130 km/h, +4 deg – standard gliding position, +13 deg – standard landing position, +18 – super steep approach for short runways and emergency. 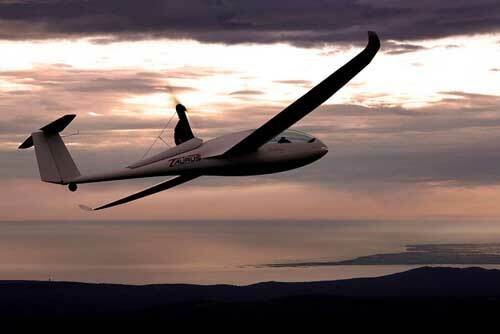 To sum up, gliding with Taurus with 2 pilots is completely on par with a DG100 (1:40 -single seat glider) if not better. We are VERY VERY happy with this, and I’m sure you will be too! The instrument panel of the Taurus has plenty of room for additional gauges and flight monitoring equipment, finished in carbon fibre it also looks great. The official release from the Pipistrel factoryDuring the course of test flights on ship sn.002, Pipistrel’s Flight Test department with Franci Popit and Tine Tomazic measured Taurus flight performance with great success. We are proud to announce the aircraft is performing better then expected, exceeding computer calculated performance in many ways! Data obtained through state-of-the-art GPS and pressure probe measurement were later analized using MATLAB environment for technical computing (www.mathworks.com), where also all the performance charts were plotted. For flight data recorder visualization a leading-edge SeeYou software (www.naviter.si) was used. 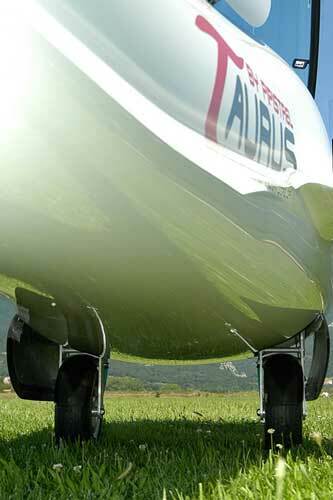 The Taurus has a unique fuselage shape which contributes to the good glide performance of this aircraft. 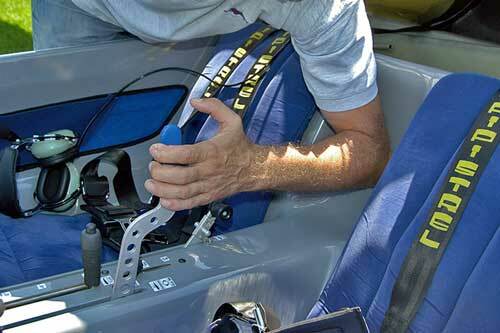 The dual seating is a side-by-side which makes the aircraft ideal for training or joy flights. To have the measurements as accurate as possible, a series of flights were flown in the early morning hours (6 – 7 o’clock local time) of several consecutive days. 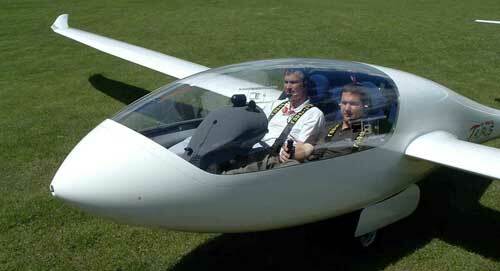 The aircraft used for these test flight was not, apart from cleaning the airframe, specially prepared in any way. • Climb to 500 m (1650 ft) AGL is 3 minutes! • Climb to 1000 m (3300 ft) AGL is 6 minutes! • Climb to 1500 m (5000 ft) AGL is 10 minutes! Landing of the Taurus is straightforward with good ground handling ability. The retractable undercarriage offers a wide stands and good stability. If you are interested in purchasing a Taurus aircraft the current price is Euro 70,000 plus shipping and any local taxes. Orders are currently being accepted for delivery in the second quarter of 2006. Further specifications and information on the Taurus can be found at our web site.